So yes, for those who can’t read between the lines, we’re leaving the comforts of Western North Carolina winters and heading north sometime around August 4th. There’s a ton of emotions involved in leaving behind our family, friends, and everything else we know and love about North Carolina, but God has truly had his hand in this from the very beginning. He has confirmed in at least 100 ways that this is definitely our next step in serving Him. Bonnie and I both should be blogging about some of those things soon. The whole GCC team has been incredible through this entire process. We had an amazing interview weekend in Granger a month or so ago and can’t thank the team enough for what you’ve already done to make us feel welcomed and a part of the family. Jason and his wife Kim have truly gone above and beyond the call of duty and opened their home to us on multiple occassions as we’ve visited the area. Not only do we feel like we’re joining the GCC team, we even feel like we’re an extension of the Powell family! Jason and Kim – we certainly owe you a big, public thank you (and probably some free child care at some point). Thanks a million times over for being so welcoming and supportive during this entire process – I’m not sure we could’ve done it without you! As I said earlier, we’ll both be writing more about this in the coming weeks leading up to our move, but in the meantime, we could sure use your prayers. Thanks! It took many hours to upload, even with the full 3Mbps upstream link at the office, but I managed to get my photos from Moscow uploaded to Flickr late Monday afternoon. There are 581 photos in the set, so even if you put the slideshow mode on “Fast” you’ll be there a while. I did some experimenting with my Canon PowerShot S410 this time. Almost all of the shots were done in Manual-mode, a big departure from always shooting in Auto. The main reason I did this was so I could use the “Vivid” color setting after reading about it on a site that David Szpunar linked to in the CITRT IRC channel. Even though I was using Manual, most other settings remained on Auto except for a few of the night-time shots which required some tweaking and the up-close shots which I shot in Macro mode. We’re minutes away from going to bed. We’ll be waking up around 3:30AM on Thursday morning to head to church to meet up with our mission team and leave for the airport. Yes, that time will probably already have passed by the time you read this. 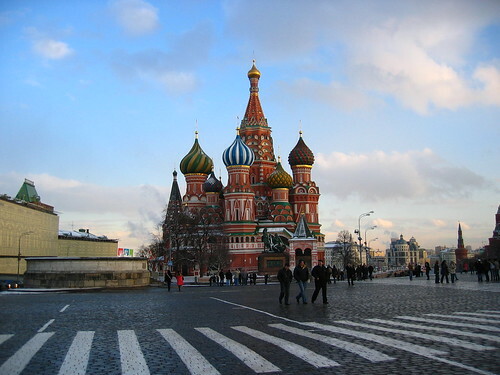 This will be our third trip to Moscow, the previous two in March of 2005 and October of 2006. Those if you quick with math will see that Crestview is averaging sending a team about every 18-months to assist with the church plant in the Golovinski region of Northern Moscow. We’re super excited about the work God is doing there. If you go back and read this Four Things post from two years ago, you’ll see that one of the things I wanted to do before I die was “Attend church in the Golovinski region of Moscow, Russia.” That may sound rather simple, but two years ago, there was no Protestant, Christ-following church in the region. In October of 2006, I did it. Interestingly enough, I think I’m more excited to go back this time and take part in a much more mature body of believers. Now the sort of sad part – I’ll likely be 100% off the grid for the next eleven days. No phone, no email, no #citrt, no internet of any kind. If you need to get in touch, I highly suggest you do it before 4:00 PM EST which is the time I’m scheduled to board the flight to Moscow @ JFK in New York. Otherwise, pray for a divine message to be delivered to me. We’ll be back home on Monday night, March 31st and I’ll have a quick one-day turnaround before heading to Oklahoma City for Spring Church IT RoundTable. These next two-and-a-half weeks are going to be one tremendous experience and I can’t wait to see what God has in store for me, Bonnie, and the rest of our mission team. I hope you will all be praying for God to move in a mighty way in Moscow. Tony Dye has been after me this week to put together a “definitive guide to all things Church IT on the web” and it’s kind of hard to turn down such a nice guy. A good place to start is the “official” Church IT RoundTable website – www.citrt.org. When formal plans for a RoundTable have been made, there will be information posted there. Also, the contents of this post will be mirrored there. Think of it as a portal page for Church IT. The Church IT RoundTable world is really all about community, and that’s what all of these resources are built around. There is just a wealth of information on the forum/mailing list. The two are actually linked together, so you can choose which format you’d like to use to participate. The wiki is really still in it’s infancy, but the content that is there is really quite useful. The Podcast is the first and third Thursday of every month at 2:00 PM EST. I always look forward to Podcast Thursdays. Being a part of the live, interactive talkcast is extremely cool and no matter what your level of technical interest, I can guarantee you will learn something here. We also have a CITRT Planet aggregator that pulls posts from quite a few blogs, including this one. For a much more complete list of Church IT blogs, check out Clif’s blogroll in the sidebar at Appian Way.